APEX 3.2 has just been released and you can now download it from OTN here. As previously noted, there is new documentation, Oracle by Examples and other updated content on the APEX OTN Page. With every new release there are a number of additional security enhancements the development team adds. However, this release introduces a significant number of new security capabilities. So even if you aren't interested in converting Oracle Forms to APEX it is still strongly recommended that you upgrade to this release as soon as possible. For those of you wishing to try out APEX 3.2 and not quite sure where to start we have just released a new Oracle By Example (OBE): Converting Your Oracle Forms Application to Oracle Application Express. This OBE was created by Marcie Young from curriculum development and includes the necessary XML files and tables to be able to perform a Forms conversion on our hosted site. We hope to have another new OBE on Security available very shortly as well. Also the APEX 3.2 Documentation has just been released on OTN. Terri Jennings and Drue Baker from our documentation team have expanded the documentation to include more on what the new features are about on top of the usual detail on how to use all the features. 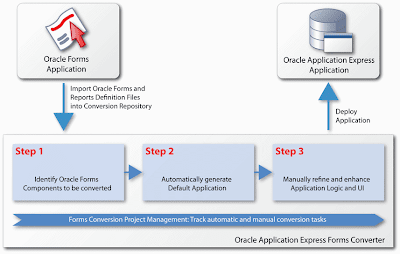 For Forms Conversion check out the following Migration Guide chapters - Chapter 2 - Overview of the Migration Process and Appendix A - Oracle Forms Generation Capabilities and Workarounds. In respect of all the security enhancements we have completely revamped the Application Builder User's Guide - Chapter 13 Managing Application Security to make it easier for developers and administrators to learn how to harden the security of their applications and the development environment. There has been a lot of talk about running applications in the cloud. Oracle is certainly a player in this new paradigm and is partnering with Amazon to offer deployment of Oracle software in the Amazon Elastic Compute Cloud (EC2) environment. So my question is - Has anyone deployed any APEX applications in the cloud? If so I would love to get as much detail as possible. For all those people who have been itching to try out Forms Conversion for yourself now is your chance. Joel Kallman has updated the free hosted "development" environment on http://apex.oracle.com to APEX 3.2. A special thank-you to all those that participated in the "limited" Early Adopter program. Regrettably we couldn't conduct our usual open EA program. I had literally hundreds of requests, as recently as in the last few days, which we couldn't accommodate. To all those people who have been waiting please try out the hosted site and let us know of any issues via the OTN Forum. The 3.2 New Features page gives an overview of the new functionality available. You will need to have at least one installation of Oracle Forms 9i or 10g. These two versions include the Forms2XML utility required to create XML files from Forms source files (fmb's, mmb's, etc.). 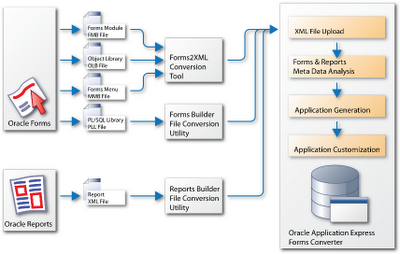 We have done very limited testing with Forms 4.5 and 6i fmb files and successfully run them through the Forms2XML utility without needing to upgrade the Forms to 9i or 10g prior to the conversion. However, we can not guarantee that the utility will always work for these older Forms modules. If it fails you will need to upgrade your Forms 4.5 and/or 6i source to Forms 9i or 10g and then run them through the utility. Once you have created the XML files you will need to go to Application Migration from the APEX Builder Home page and create a project. You will also need to build the referenced tables and views within your workspace. After loading up the XML files you can start conversion and the manual post-generation enhancements required.